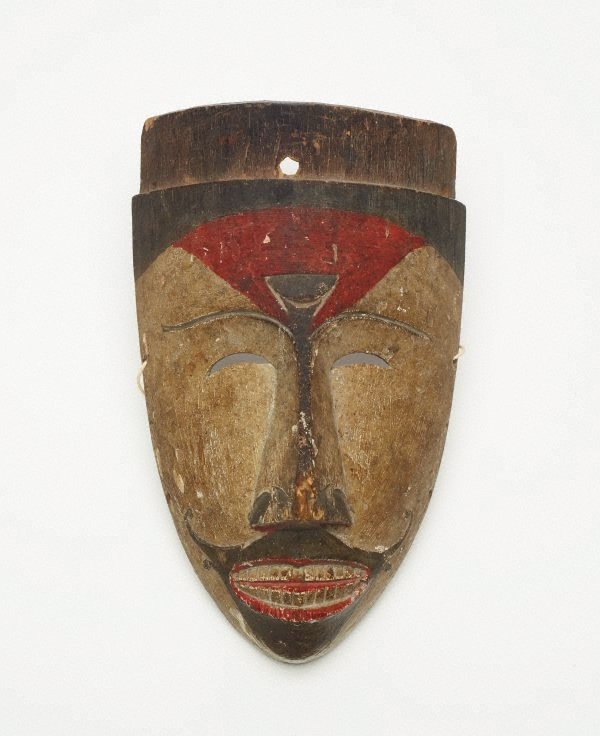 Throughout Borneo carved wooden masks are used for rituals to ensure fertility and success, and to ward off malevolent spirits and forces of the supernatural world. The Apo Kayan Dayak groups of East Kalimantan, including the Kenyah, Kayan, Busang, Modang, Long Glat and Bahau, are renowned for their elaborate, theatrical representations of gods, spirits and ancestors to ensure bountiful yields at the time of rice planting and harvest. While some masks are worn to channel rice deities and spirits, others are used to entertain and frighten members of the community. This stylised depiction of a jester-like figure or spirit would have once had large wing-like ears affixed to its face, a distinctive feature of ‘hudoq’ masks. Apo Kayan Dayak use of art motifs is determined according to a rigid class structure with some imagery, such as human faces, confined to the aristocracy. Ancestral art of the Indonesian archipelago , Sydney, 2017, 33 (colour illus. ).